Now accepting PayPal, read instructions here. High performance systems able to process images in real-time for vision guidance. They offer plenty of interfaces. Low power, small size and low weight, they are designed to fit in your embedded control application. Designed to answer the needs of mobile robotics vision: monochrome/color, global shutter, high dynamic range (HDR), compact and low power. 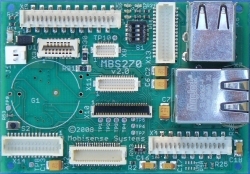 They are also well suited for many embedded and portable computer vision tasks. >>> Go to camera modules page. Highly efficient DC/DC converters accepting various voltage inputs without wasting energy. >>> Go to power modules page. >>> Go to accessories page.